As I grew older, there was a brief moment in time when I wondered why I could not see my guardian angel, especially since so many great artists were able to paint pictures of them. Some were curly haired toddlers with small wings. Others were tall, lean, and graceful women with a serene countenance sitting next to someone in need or hovering over someone in protection, also with wings but these were long and powerful. At Christmas I heard the story of how a choir of angels burst into song at Jesus’ birth. These angels, of course, were dressed in white choir robes with red sashes. The wings seemed optional for a choir of angels. I do believe that my one of my earliest memories of angels came from Hollywood in my favorite movie, It’s A Wonderful Life. I loved the sweet, doddering Clarence who was out to save George Bailey from suicide by showing George how he had made a difference in so many lives. I always cried when little Zuzu hears a bell ring and says, “Every time a bell rings, an angel gets his wings.” My image of angels was that they were like humans and had to earn their wings. Other than loving Clarence, for much of my childhood and into my early 20s I gave little thought to angels. I suppose I believed in them, but I was not sure if their existence was real or it was part of some folklore or tradition passed down in the Catholic Church. My view of guardian angels changed one day talking to a former student of mine named Susie, who had recently survived a horrific car crash. Susie was a devout Catholic, who was in the youth choir with me and at one point was in the church youth group I ran. I knew her pretty well. When Susie was in college in Miami, Florida, she was dating a man who lived in Tampa. On the weekends, they would take turns visiting one another. This one particular Friday night Susie got a late start on her trek to Tampa. She was traveling down Alligator Alley, famous for its desolate and dangerous roads that run right through the Florida Everglades. Now it is part of Interstate 75, but before that the road and ditches were often overrun with alligators—big ones—hence the name Alligator Alley. Susie was very tired, and the road was very dark. It was no surprise that she fell asleep at the wheel going 70 miles an hour. By some fluke, Susie plowed into the back of a large construction truck. I think it was a dump truck that was parked on the side of this deserted road. A man named Tim was driving the opposite way just at the time Susie crashed. He went to her aid. Susie’s entire car was crushed and mangled, all except the area around the driver’s seat. Tim, the Good Samaritan, immediately called 911, and emergency services came to rescue Susie, who remarkably was conscious at the time. The EMS worker, a man named Tim, helped cut Susie out of the car, and then she was placed in an ambulance where the driver, a different man named Tim, rushed her all the way to a Tampa hospital. When she was checked through the ER, her nurse—Nurse Tim—helped her through the ordeal. The doctors released Susie the very next day because the only injuries she sustained were some cuts to her scalp from broken glass. Susie walking away from this horrific accident, not paralyzed, with no traumatic brain injury was nothing short of miraculous. Everyone who knew Susie was certain her survival was God’s work. When Susie told me about the accident, I couldn’t help but say, “I guess now you know the name of your guardian angel.” She laughed but said that is exactly what she thought as well. This incident really made me think about guardian angels in a more mature way. Was Susie protected by her guardian angel? Was his name really Tim? I don’t know, but I do believe that God had a hand in Susie’s very extraordinary survival. After that, I felt certain that I too had a guardian angel that had a name. I would often wonder what that name was, and what this angel was like. Was my guardian angel one of my grandmothers looking out for me? What it someone I had no connection to? What did this guardian angel look like? A glorious figure in a Michelangelo painting? When my very active children were born—all in three years—I often joked about how tired their guardian angels must be trying to keep up with one who climbs in cabinets and on refrigerators, one who sticks every bit of matter—organic or inorganic—in her mouth, and one who somehow is able to bypass most baby gates and locks. All I know is that my husband and I fortified the house with every baby-proofing product imaginable, and they still managed to get into trouble. The joke eventually became just a fact of life in our eyes. God gave our children very hearty guardian angels. He must have or else these toddler Houdinis would not have lived past the Terrible Twos. Although I continued to wonder, I never really investigated what guardian angels were, that is, until recently. It turns out I had a very childish understanding of them. First, according to the Bible and Catholic Church tradition, every human being is assigned a guardian angel whose sole purpose is to protect, guide us, and pray for us. Moreover, there are bad angels known as demons who try to separate us from the love of God. These demons are fallen angels because they chose sin over God’s goodness. Also, angels are part of many religions. In Islam, followers believe in Mu’aqqibat, two guardian angels—one who walks in front and one who walks in back of the person. In Judaism, followers believe that God the Father appoints each person a Malakh, an angel that means messenger of God. So according to many religions, yes, they really do exist, and they are not some made up beings for the Hallmark Channel’s Christmas movie marathon. I find it very comforting that in my faith guardian angels are real. I know my guardian angel is not some magical being, but God’s special assistant whose sole job is to guide me in the right direction and protect me from anything that puts a barrier between God and me. I doubt guardian angels have names because they are not human, but I’d like to think that if they did, mine might be Clarence Jr.
Cara, I loved this post! I tell Landon every night that he doesn’t have to be afraid because his guardian angel is with him. Thanks. 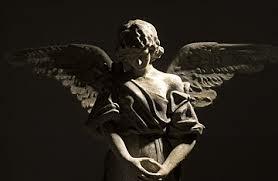 This fascination with angels is new for me, but I’ve enjoyed learning about them. Do you wonder what Landon’s guardian angel’s name may be? How about your new baby? Thanks for reading. I appreciate it. Lovely post Cara. I didn’t grow up with this idea – it must have been very comforting and beautiful.